Photographer Joe Clark (a.k.a. 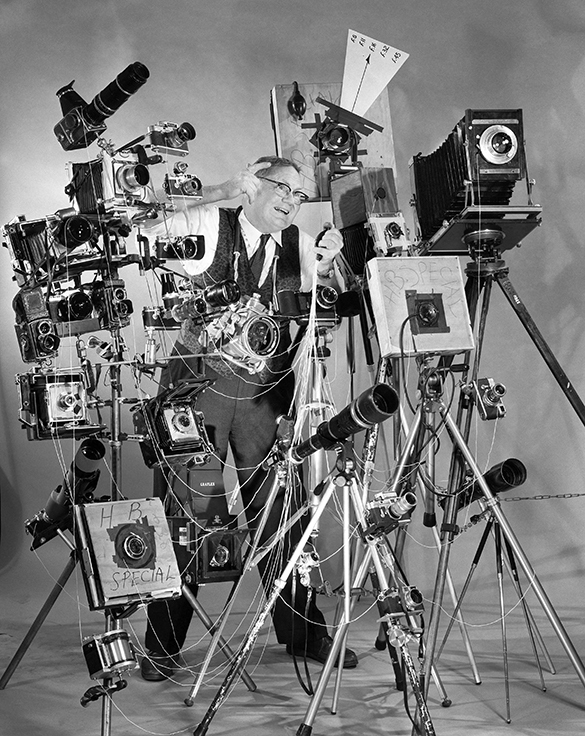 “Hill Billy Snap Shooter”) posing with a large display of cameras. Photograph by Hugh Morton. The Albertype Co., headquartered in Brooklyn, N.Y., produced postcards and other printed materials from 1890 until 1952. The company utilized a specific photomechanical processes process invented by Joseph Albert in Australia in the late 1860s, which was an improvement on the collotype photographic process. The company had teams of photographers who traveled across the United States taking and buying images depicting people, places, and activities in all parts of the country. A majority of the images were published as postcards and marketed to be sold in the locales depicted in the images. The images in this collection, circa 1900-1930s, depict buildings, monuments, people, and scenes in a number of cities and towns across North Carolina in over 50 different counties. Included are black-and-white photographic negatives (original and duplicates) and black-and-white photographic prints. Collection consists of the 60 photographic prints used to produce Sodom Laurel Album (2002). Sodom Laurel Album chronicles Dellie Norton and her family, 1975-1994, who lived in the small mountain community of Sodom Laurel, located in Surry County, N.C. The collection also contains a copy of Sodom Laurel Album (2002). Ambrotypes were in production from the early 1850s into the early 1880s. This photographic format replaced earlier methods and quickly became extremely popular due to the lowered cost of processing, relative ease of development, and the superior images produced by the process. The resulting images were encased and had a reputation for being more durable than previous formats. The Ambrotype Collection includes an image of North Carolina Black Muslim slave Omar Ibn Said; members of the Marford, and Myers families; a slave owned by the Marford family; Harris and Umstead family members; students at Wesleyan Female Institute in Murfreesboro, N.C., from the 1850s; and Civil War-era images of General Bryan Grimes of the 4th North Carolina Infantry Regiment, members of the “Iredell Blues,” and Meshack F. Hunt of the 5th North Carolina Infantry Regiment. Between 1984 and 1987, celebrations were held in North Carolina and England to commemorate the 400th anniversary of English colonists settling in America. The collection contains photographs and printed material documenting the celebrations of the 400th anniversary of the late-16th-century English voyages to Roanoke Island, N.C. Photographs document events at the Fort Raleigh and Elizabeth II state historic sites in Dare County, N.C., as well as a ceremony in Plymouth, England. People appearing in the photographs include journalists Sam Ragan, North Carolina governors James B. Hunt and James G. Martin, and Princess Anne of Great Britain. Elizabeth Tannahill Bain (1893-1967?) lived at Chapel Hill, N.C., and Virginia Beach, Va. She was the daughter of Charles Wesley Bain (1864-1915), professor of Greek and Latin at the University of North Carolina, and Isabel Plummer Bain, a native of Petersburg, Va. As an adult, Bain served as department secretary to the Department of Romance Languages at the University of North Carolina. The collection consists of one photographic album and loose photographic prints, circa 1890 through 1933. The album, circa 1914 to 1933, has views of Chapel Hill, N.C., and the University of North Carolina campus. Included are photographs of Coker Arboretum, Commons Hall, the University Inn, Battle Park, a 1914 football game, Chapel Hill houses, students training on the campus during World War I, University Day in 1917, and miscellaneous social activities. Also included are shots from Norfolk, Va.; Lancing, Morgan County, Tenn.; and Durant Island, Dare County, N.C. The loose photographic prints consist primarily of portraits of the family and friends of Elizabeth Tannahill Bain. M. Durwood Barbour, a member of the 1952 class of the University of North Carolina and a resident of Raleigh, N.C., became interested in picture postcards as an offshoot from his hobby of collecting North Carolina bank notes and his appreciation for early photographic images of the state. Over the course of twenty-four years Barbour accumulated a collection of over 7,800 picture postcards. The Durwood Barbour Collection of North Carolina Postcards contains nearly 8,000 picture postcards collected by M. Durwood Barbour, 1950s-1980s. Included are views of almost every town and city in North Carolina. There are also postcards depicting scenes related to African American history, parades and public gatherings, agriculture and industry, military history, scenic views, public buildings such as courthouses and railroad stations, and disasters such as fires, floods, and train wrecks. Also included are “real photo” postcards. Billy Ebert Barnes was born in Winston-Salem, N.C., and graduated from the University of North Carolina in Chapel Hill in 1953. After working as a photographer for McGraw Hill Publishing Company in the late 1950s and early 1960s, he became the Public Relations Director (and official photographer) of the North Carolina Fund. The North Carolina Fund was a state-chartered, non-profit corporation established by Governor Terry Sanford in late 1963 to seek new ways to address the problem of poverty in North Carolina. After his work with the North Carolina Fund ended, he continued to work with several organizations that grew out of the Fund’s efforts and did free-lance photography for numerous companies and corporations. The Billy E. Barnes Photographic Collection contains approximately 63,000 images taken during the early years of Billy Barnes’s career from 1959 to 1996. The majority of the images are black-and-white 35mm negatives, but there are also photographic prints and 35mm transparencies (slides). During this part of his career, Barnes worked both as a freelance photographer and as an official photographer for several organizations and companies. Also included are images taken across the state of North Carolina that highlight poverty in both rural and urban areas, racial tension, experiments in integrated education, poverty prevention/alleviation programs, and the social/political changes that occurred in the state during this span of almost four decades. A large portion of the collection documents the activities of the North Carolina Fund (1963-1968) as well as related organizations and programs that outlasted the Fund project. Images were taken across the entire state, but with a concentration in Durham and Orange County. There are also some images of locations outside North Carolina. Barnes’s original descriptions are used when available (from personal photographic log) and, whenever possible, individuals, organizations, events, locations, and dates have been identified. Known groups, organizations, and individuals are listed as subject access points, as are identified locations. Kemp Plummer Battle (1831-1919) served as North Carolina State Treasurer from 1866 to 1868 and as president of the University of North Carolina from 1876 to 1891. Battle graduated from the University in 1849 as the valedictorian of his class and went on to work as a lawyer and bank director. In 1861, he was a delegate to the Secession Convention, and served during the Civil War as president of the Chatham Railroad. In 1862, Battle was elected trustee of the University; he was elected Treasurer by the legislature in 1866 but removed from office in 1868 because of his service to the Confederacy. He was named president of the University of North Carolina in 1876 and resigned in 1891 to become Alumni Professor of History. Battle compiled a significant body of scholarly work, the most significant being his two-volume History of the University of North Carolina. The Kemp Plummer Battle Photograph Album of the University of North Carolina was owned by Battle and produced by “Foster, Artist and Photographer” of 112 N. Ninth Street in Richmond, Va. The album contains 74 photographs of campus, student organizations, athletics, and the town of Chapel Hill, N.C. The album was produced circa 1894, however, many or all of the images included are copied from originals which may date from much earlier in the 19th century (e.g., a composite image on Page 8 shows the faculty of 1844). According to a handwritten note inside the front cover of the album which appears to have been written in 1897, the photographs were taken in 1892; however, some appear to date from as late as 1894. John Cartwright Bell, Jr. was born in Windsor, N.C. around 1915. The materials in this collection consist of 18 black-and-white photographic prints and 18 copy negatives made from a photographic album created by John Cartwright Bell Jr. The photographs were made in the 1930s and show historic homes and buildings in Bertie County, N.C., Camden County, N.C., and Chowan County, N.C.
Samuel Moyle Boone (1919-2008), native of Gates County, N.C., and son of William Jordan and Minnie Belle Williams Boone, received his A.B. degree in 1949 and his Masters of Library Science in 1964 from the University of North Carolina. Boone served as a member of the staff of the Academic Affairs Library (now the University Library) at the University of North Carolina for 30 years. He was appointed head of Photoduplication Services in 1952, in which role he is credited with building the Library’s microfilm collection. Also a photographer, Boone shot local events, portraits, campus scenes, and scenic views, and photographed for the Alumni Review during the 1950s. The collection consists of photographs, circa late 1940s-early 1960s, depicting the University of North Carolina campus in Chapel Hill; people (primarily staff and faculty of the University Library and other departments, also including portraits of authors Betty Smith, Manly Wade Wellman, and Kermit Hunter, and some shots of UNC football); Chapel Hill community groups and events; and scenic views, including the Blue Ridge Parkway. A significant subset of negatives document the construction of the 1952 addition to the Louis Round Wilson Library. The original owner of the collection was John Archibald Brady of Statesville, N.C. The John Archibald Brady Collection consists of 164 stereograph cards of scenes from around the world. Many of these stereographs are part of a commercially produced two-volume set titled View of the World produced by the Keystone View Company. None of the stereographs depict scenes in North Carolina. Ignatius Watsworth Brock (1866-1950), known as Nace, was a professional photographer based primarily in New Bern and Asheville, N.C. Brock studied photography and served as an apprentice in the studio of Edward Gerock in New Bern. In 1897 Brock moved to Asheville, where he ran Brock’s Photo Art Studio for more than forty years and lived until his death in 1950. Brock was an active painter and wrote poetry throughout his life. The collection consists of about 430 images made by Nace Brock from circa 1889 to 1934. Images depict local individuals and various scenes from in and around New Bern and Asheville, N.C. Individuals include Nace Brock, members of the Brock family, Bayard Wootten, S. Westray Battle, and Cornelia S. and Edith D. Vanderbilt. Related materials include correspondence between Brock and Bayard Wootten, poetry written by Brock, and printed materials. Paul Buchanan was born around 1910 and lived at Hawk in Mitchell County, N.C. He learned photography from his father, Lafayette “Fate” Buchanan, who engaged in the business on a part-time basis. In the 1920s, Paul Buchanan started working in the medium professionally and often traveled in the mountain counties of Mitchell, Yancey, Avery, and McDowell in search of subjects. Paul Buchanan died in 1987. The collection consists of 37 prints made from original negatives loaned to the North Carolina Collection Photographic Archives for printing. Buchanan’s photography is not stylized; his subjects dressed as they wished and his photographs appear spontaneous. The images show unidentified men, women, and children in the mountain counties where Buchanan worked. Some of the people are posed in front of quilts. A few of the images include dogs and horses. The photographs appear to have been made in the 1920s and 1930s. In the summer of 1930, Lillian Alexander Burch was a student who participated in a study tour to the west coast of the United States sponsored by the Extension Division of the University of North Carolina in Chapel Hill, N.C., 7 June-2 August 1930. Burch made the photographs in this collection and collected postcards as the tour moved across the country. The collection contains 154 prints and postcards created or collected by Lillian Alexander Burch on her 1930 study trip. The images show popular tourist sites as well as views of tour participants. The group camped for part of the trip and some of the photographs include camp scenes. Photographs made at the Hal Roach Studio in California include Oliver Hardy and Charley Chase. Most of the images are mounted in an album with captions that was put together by Burch. The collection also includes a small number of papers related to the trip. The original owner and possible creator of the collection was P.M. Candle, who may have worked for the United States Department of the Treasury. Candle sent the images to his wife enclosed in an envelope from the Office of the Federal Prohibition Director in Greenville, S.C. The Bureau of Prohibition, part of the Department of the Treasury, was responsible for the enforcement of the 18th Amendment to the United States Constitution, which prohibited the sale of alcohol, 1919-1933. During Prohibition, the Bureau of Prohibition regularly raided and dismantled moonshine and other liquor stills, arresting numerous people for the illegal manufacture and sale of alcohol. The collection consists of two images of moonshine stills near High Point, N.C., which were raided by Department of the Treasury prohibition officers in or around 1927. Also included is a letter about the individuals in one of the photographs. Mary Grace Canfield (1864-1946) was a native of Vermont and the wife of the Reverend Harry Lee Canfield (1860-1942), a Universalist minister working in North Carolina. The Canfields came to North Carolina in the 1920s. The collection consists of 246 black-and-white photographic prints that appear to date from the 1920s and are probably the work of Mary Canfield. The images show historic homes, farm buildings, churches, street scenes, Confederate veterans, gristmills, and monuments throughout North Carolina. The collection consists of two photograph albums, a few loose photographs, and two newspaper articles relating to the activities of the Carolina Mountain Club of Asheville, N.C., in the 1930s. The first photograph album highlights outdoor activities of club members, both men and women, from December 1930 to May 1932. Nature photographer George Masa (1881-1933) was a founding member of the club and served as club photographer until his death in 1933. George Masa is believed to have taken many of the images in the first album and is also present in several of the group photographs found in the first album. The second album, circa 1937, depicts views from various locations in western North Carolina. The Carolina Trucking Development Company was based in Wilmington, N.C., in the early part of the twentieth century. The Company appears to have been primarily devoted to agricultural development and was involved with establishing farming communities in several counties in North Carolina, some of which were populated by immigrant groups, including German, Dutch, Italian, and Polish peoples. The images in the collection appear to have been taken by or at the request of the Carolina Trucking Development Company, probably for use in promotional materials such as brochures or pamphlets advertising farmland for sale. The images depict farmland, houses, schools, individuals and groups, and farming activities in various agricultural communities in Columbus, New Hanover, and Pender counties. Aros Coke Cecil (1897-1958) was born in High Point, N.C. Cecil graduated from the University of North Carolina’s School of Pharmacy in 1917. While attending the University, Cecil was a member of the “University of North Carolina Student Battalion,” which would become the Univeristy Reserved Officer’s Training Corps when the United States became involoved in World War One soon after he graduated. After serving in World War One, he returned to High Point, N.C. In 1925 he opened Cecil’s Drug Store, and in 1946 he opened Cecil’s Office Equipment Company. He died in 1958. The collection consists of a 20 page photograph album created by Aros Coke Cecil in 1918. Each page contains between two and four images depicting student social life on campus at the University of North Carolina and in Chapel Hill, N.C., and High Point, N.C. Of interest are images depicting commencement, the “University of North Carolina Student Battalion,” campus buildings and dorms, women on campus, and an image of an unidentified African American (beleived to be a member of the University housekeeping staff) in a dorm room. Also included in the photograph album are documents related Cecil being drafted into the United States Army in 1918. Frank Clodfelter started work for the Southern Railway in 1931 and, during his career, held a variety of posts including that of locomotive engineer. Photography was one of Clodfelter’s interests, and he won several awards for his photographic work. The collection consists of 14 black-and-white images and 229 color slides made mostly of railroads in western North Carolina between 1952 and 1981. Collier Cobb (1862-1934) was chair of the Geology Department at the University of North Carolina, 1893-1934. His photography stemmed from his work in geology and other sciences, and he traveled extensively and used photography to document his interests. In the 1890s, Cobb built a darkroom in his Chapel Hill home, where he developed negatives and printed prints. The collection consists of photographs made by Collier Cobb in a variety of settings, including Chapel Hill and other North Carolina locations; the University of North Carolina; and Alaska, Canada, and Siberia. The collection is composed largely of glass plates (slides and negatives), as well as some photographic prints. Topics include buildings, grounds, faculty, staff, students, events, and African Americans at the University of North Carolina; residences and churches in Chapel Hill, N.C.; logging in western North Carolina; North Carolina schools in Bertie, Columbus, Craven, Durham, Forsyth, Gaston, Guilford, Harnett, Iredell, Mecklenburg, Onslow, Robeson, Sampson, and Wake counties; and Eskimos and Eskimo life. The Commercial Museum, located in Philadelphia, Pa., was in operation from 1897 to 2010. Modeled after the great exhibition halls of the World’s Fairs (World Fair, Universal Exposition) of the late nineteenth century, the Museum offered a vast selection of displays and information related to commerce and trade in Pennsylvania, across the United Sates, and the international marketplace. The Museum maintained a large collection of photographs documenting a variety of industries, agriculture, and trade in many areas of the United States. These images were marketed for use in publications around the United States and the world. The images, circa 1923-1939, document agriculture and industry in Alamance, Anson, Cabarrus, Catawba, Cleveland, Gaston, Halifax, Moore, Sampson, Wayne, and Wilson counties in North Carolina. A few towns are also identified. Subjects include cotton, farming, lumber, pottery, and tobacco. Also included is a small selection of images documenting agriculture and industry in unknown locations around North Carolina. Bruce Cotten (1873-1954) was born in Wilson, N.C., and over his lifetime became a serious collector of books and other materials related to North Carolina. The Bruce Cotten Image Collection includes images, chiefly 19th century, relating to North Carolina individuals and places. While there are a few salt prints, most images are etchings, colored engravings, drawings, reproductions, or copy work. Included are images depicting members of the United States House of Representatives from North Carolina taken by Matthew Brady, various locations in North Carolina, battles during the American Civil War in North Carolina, and the regional flora and fauna. Lyman Atkinson Cotten (1909-1990) graduated from the University of North Carolina in 1936 and from Yale University in 1941. He taught English at the University of North Carolina for 34 years, retiring in 1974. Cotten was a trustee of the Order of the Gimghouls, a secret society at the University, from 1952 until his death. He was also a member of Phi Beta Kappa, the Society of the Cincinnati, and the Modern Language Association. The collection contains about 2,900 items related to Lyman A. Cotten’s family. Included are materials created by or related to his parents, Lyman A. Cotten (1874-1926) and Elizabeth Henderson Cotten; his grandparents, Robert Randolph Cotten and Sallie Southall Cotten; his brother, John Henderson Cotten; and his uncle, Bruce Cotten, and his wife, Edyth Johns Tyson Cotten. Some images relate to the naval careers of members of the Cotten family. Paul Cuadros was born in Ann Arbor, Mich., the third son of parents who immigrated from Peru. He attended the University of Michigan and Northwestern University’s Medill School of Journalism and focused his career in journalism on writing and reporting on issues of race and poverty. In 1999, he was awarded an Alicia Patterson Foundation Fellowship to write and report on the impact of emerging Latino communities on the rural South. This resulted in the book A Home on the Field: How One Championship Team Inspires Hope for the Revival of Small Town America (2006). The Paul Cuadros Photographic Collection is primarily composed of images related to the Latino immigrant community in central North Carolina, particularly in Siler City. They were taken when Cuadros was living there researching the Latino migration to the American South. The subjects of the images include the living conditions of immigrants; poultry and agricultural workers, including injured poultry workers; social and community events such as quinceaneras and festivals; religious events, including a passion play; children in school, including a contentious meeting of the Siler City School Board in September 1999; and anti-immigration rallies, including one led by David Duke in February 2000 and the response to that rally. Also included are a few images from North Carolina locations outside Siler City and a few from outside North Carolina. Daguerreotypes were in production from the late 1830s into the early 1860s. This photographic format is considered to be the first method that resulted in images that could be made widely available to the public due to the relative simplicity of the process and high quality of the images produced. The resulting images were typically encased and brought photography into the general public marketplace. The Daguerreotype Collection contains images taken of individuals and couples seated or standing for portraits, circa 1839-1860. Frank A. Daniels (Frank Arthur Daniels Jr., born 1931) of Raleigh, N.C., was president and publisher of the Raleigh News and Observer and a civic and business leader. His father, Frank A. Daniels Sr., and his grandfather, Josephus Daniels, were also publishers of the News and Observer. The collection consists of 812 negatives and 14 prints that primarily depict the Daniels family. The bulk of the images date from the 1960s and 1970s and are portraits or family groups. Included are black-and-white and color negatives, original and copy, as well as a small number of black-and-white prints. Hester Davis and John Grant were anthropology graduate students at the University of North Carolina in Chapel Hill, N.C., when the images in this collection were taken in 1955-1956. Davis and Grant went with a group of anthropology graduate students to do field work observing the community in Qualla Boundary, home of the Eastern Band of the Cherokee Nation in western North Carolina. They used their findings to write their masters theses, which were both published in 1957. The collection consists of approximately 450 images that were made in 1955-1956 at Qualla Boundary by Hester A. Davis and John L. Grant. The images document the domestic and religious life of adults and children as well as leisure activities in the Big Cove Community. Also included are views of homes, churches, schools, and farm buildings in the community. The collection consists of an estimated 1.6 million photographic negatives and prints made by over 40 staff photographers at the Durham Morning Herald (1945-1991), Durham Sun (1945-1991), and The Herald-Sun (1991-2002). The collection includes images taken by staff photographers between 1945 and 2002 chiefly in the city of Durham, Durham County, Orange County, Wake County, and surrounding areas of North Carolina. Included are images of local, state, and national politicians and political events; news events; local businesses; civic groups and other organizations; Durham County, Orange County, and Wake County schools; sporting events; and other images that document daily life in North Carolina. Collection includes both published and unpublished photographs. Mary Claire Engstrom was born in 1906 in Kansas City, Mo., and moved to Chapel Hill, N.C., to attend the University of North Carolina, earning her Ph.D. in English literature in 1939. After she and her husband, Alfred G. Engstrom, who taught French at the university, purchased the historic Nash-Hooper house in Hillsborough, N.C., she began to focus on the historical documentation of Hillsborough and its environs. She was instrumental in founding the Hillsborough Historical Society in 1963 and served as chair of the Historic Hillsborough Commission, 1964-1966 and 1976-1983. She undertook a project documenting 122 old structures and historic sites in and around Hillsborough and Orange County for the Historic American Buildings Survey, 1963-1965. Her research and documentation helped many of these buildings qualify for listing in the National Register of Historic Places, including the Nash-Hooper House as a National Historic Landmark. She was also involved in a survey of cemeteries and graves in Orange County. Engstrom lived in Hillsborough and continued her historical research until her death in 1997. The collection contains over 2,000 images created or collected by Mary Claire Engstrom, 1930-1979, documenting the Hillsborough and Orange County, N.C., area. There are images of historic individuals and families, including Governor Abner Nash; Governor William A. Graham; William Hooper, signer of the Declaration of Independence; and Thomas Ruffin, chief justice of the North Carolina Supreme Court. There are also images of historically significant homes, churches, and other locations, including the Bingham School; the Alexander Dickson House, used as a headquarters during the Civil War; the Hillsboro’ Military Academy; the Nash-Hooper-Graham House, home of William Hooper; and the Nash-Kollock School. Also included are images of cemeteries, among them the Chapel Hill Memorial Cemetery, the Old Chapel Hill Cemetery, the Hillsborough Cemetery, the Hillsborough Old Town Cemetery, the West Hillsborough Cemetery, and church and family cemeteries. Exploring North Carolina is the first high-definition format television program shot and produced in North Carolina. From its inception, the program’s stated purpose has been “to identify and explore North Carolina’s most unique and important natural resources.” Program episodes feature the plants, animals, geology, and history, both natural and social, of North Carolina. The program attempts to give equal coverage to North Carolina’s Mountains, Piedmont, and Coastal Plain regions. Of particular note are episodes on climate change, women in science, and Native Americans of North Carolina. Original footage consists of unedited videotapes used to create aired broadcast episodes of Exploring North Carolina and includes supplemental B-Roll footage, animations, interviews, and standups featuring the program’s writer and host, Tom Earnhardt. Unedited material also includes footage of the North Carolina Museum of Natural Sciences, a partner and frequent shooting location of the program. Collection materials consist of videotapes and release forms related to the production of Exploring North Carolina, as well as additional videotapes produced by the program’s videographer, Joe Albea (Joe Albea Productions). Ernesto G. Fabbri (1874-1943) was an Italian linguist who spent a majority of his life in New York City, N.Y. His first wife, Edith Shepard, was the daughter of Margaret Louisa Vanderbilt and niece of George Washington Vanderbilt (1862-1914). Fabbri was a prominent member of the Society of Italian Immigrants and served as the organization’s president early in the twentieth century. The collection consists of a photographic album and a letter from Ernesto G. Fabbri to his friend, Mr. Olin, for whom he had the album made. Fabbri took the photographs sometime in 1906 during a visit to Biltmore Estate in Asheville, N.C., the home of his wife’s uncle George Washington Vanderbilt. Images include the Biltmore House and gardens, Biltmore Farm, Antler Hill Village, and grounds around the estate. Also included are images of unidentified people who are believed to include members of the Vanderbilt family. Several of the images of the Biltmore House and estate appear in Images of America: Biltmore Estate. In 1923, Charles Anderson Farrell, a native of Yadkin County, N.C., became the first professional photographer for the Greensboro Daily News in Greensboro, N.C. In addition to his work for the newspaper, Farrell operated a photography studio, camera store, and art supply shop in downtown Greensboro. Farrell contributed photographs to several University of North Carolina Press books. The collection includes 688 photographic images (photographic negatives and prints) related to three books published by University of North Carolina Press that Farrell worked on as a photographer: Stella Gentry Sharpe’s Tobe (1939), about a young African American boy and his family; Bernice Kelly Harris’s Dramatis Personae: Photographic Studies: Eastern Carolina Folk Plays (1940), and Aubrey Lee Brook’s Walter Clark: Fighting Judge (1944), about Clark, who served as chief justice of the North Carolina Supreme Court, 1903-1924. Jerome Friar was born in South Carolina and moved to Rocky Mount, N.C., as a child. After relocating to Durham, N.C., in the mid-1970s, Friar took his first step towards what would eventually become a career in free-lance photojournalism with his coverage of a mass meeting of neo-Nazis in western North Carolina in 1980. The images he took at this event were among his first professional works to be published (and remain among some of his most requested images). Shortly after this event, Friar took his camera down to Nicaragua to cover the situation that was unfolding as the Contra War began in the early 1980s. After covering events in Nicaragua, Friar moved to Washington, D.C., so that he could cover events related to socio-economic issues that were being debated at that time. He remained a free-lance photographer, and his works were regularly used in a variety of publications. In 2008, Friar returned to North Carolina, and he currently lives on Topsail Island. He continues to take photographs of people, places, and events on the North Carolina coast and other locations around the state. The Jerome Friar Photographic Collection contains over 50,000 images created by Jerome Friar, 1978-2010. Included are images that cover broad areas of North Carolina, including Durham, Franklinton, Ocracoke Island, Portsmouth, Roxboro, Topsail Island, Warrenton, and Yadkinville, and topics relating to activities in the state. In addition to materials related to North Carolina are images related to Washington, D.C., where Friar lived for nearly 20 years. These materials primarily focus on issues related to economic injustice, poverty, gun violence, homelessness, civil rights, gay rights, environmental racism, neo-Nazi and Ku-Klux Klan activity, pollution and the environment, and Central American issues. Included are photographs of individuals involved in those issues. During his time in Washington, D.C., Friar paid particular attention to events related to North Carolina. William Clyde Friday was born in 1920 in Raphine, Va., and grew up in Dallas, Gaston County, N.C. He graduated from the Law School of the University of North Carolina in 1948, after which he served as assistant dean of students and was named assistant to University President Gordon Gray in 1951. Friday was appointed secretary of the University in 1955, named acting president of the Consolidated University of North Carolina (North Carolina State College (Raleigh), the University of North Carolina (Chapel Hill), and Woman’s College (Greensboro)) in 1956, and became president later in the year. In 1971, the General Assembly restructured higher education in North Carolina, and the Consolidated University became the University of North Carolina System. On 1 July 1972, Friday became president of the new system. He served in that capacity for 30 years, during which time the University System grew to 16 campuses. Friday retired in 1986, after which he became president of the William R. Kenan Jr. Charitable Trust, guiding the philanthropy’s support of educational endeavors. Although he retired from public service in 1999, Friday remains influential in many aspects of North Carolina life. The collection consists of photographs, 1951-1980s, that relate to William C. Friday, primarily his activities as president of the University of North Carolina system. Topics include Friday’s inauguration; the 1961 visit of President John F. Kennedy to the University of North Carolina; the UNC Board of Trustees; and Friday’s television interview program, North Carolina People, which he began in 1971. Many well-known North Carolinians and other individuals are represented in the images. John Moran Frohock attended the University of North Carolina in Chapel Hill, N.C., from 1925 to 1929. He graduated in 1929. The collection consists of 242 black-and-white photographic prints, many of which were presumably made and/or collected by John Moran Frohock while he attended the University of North Carolina. A few images pre-date Frohock’s tenure at UNC, and others appear to have been collected by an unidentified girlfriend of Frohock’s. Many of the photographs were made in Chapel Hill and include views of the University of North Carolina campus. The images taken on campus include University buildings/grounds, UNC students (Frohock’s classmates and friends), UNC sports (boxing and football), and views of Franklin Street in downtown Chapel Hill. Also included are photographs from Greensboro, Trenton, and other areas of North Carolina (including a fishing trip in the coastal region); Washington, D.C.; and the 1926 Sesqui-Centennial International Exposition in Philadelphia, Pa.
Roland Giduz was born in 1925 and graduated from the University of North Carolina at Chapel Hill with a degree in journalism in 1948. He worked for newspapers in Durham and Chapel Hill, N.C., was editor of The Chapel Hill News Leader and The News of Orange County. In 1961, he founded The Triangle Pointer. Giduz became manager of the University of North Carolina at Chapel Hill Alumni Review in 1966. He also served on the Chapel Hill Board of Alderman and ran for mayor in 1969. Giduz died in January 2009 in Chapel Hill. The collection comprises approximately 19,000 negatives made between circa 1947 and circa 1970, primarily in Chapel Hill and Carrboro, N.C. Subject matter includes people, places, activities, and events. The collection includes photographs relating to the University of North Carolina at Chapel Hill and a few other places within the state. The negatives are grouped by locality, subject, and personal name. Colin M. Hawkins was a student at the University of North Carolina in Chapel Hill, N.C., 1864-1866. The collection consists of 15 carte de visite photographs, eleven of which show students at the University of North Carolina. They are mostly from 1866. There are also 15 copy negatives. The students are wearing lapel pins that appear to be from the Chi Phi Fraternity. Four of the photographs are unidentified. The identified individuals include Colin M. Hawkins, Alonzo Phillips, Thomas Henderson Pritchard, and Edmund Jones. The photographs may have originally been part of an album belonging to Hawkins. Charles Heatherly graduated from the University of North Carolina at Chapel Hill in 1964 with a degree in journalism. His courthouse photographs appear in his book The Courthouses of North Carolina and Tales that Whisper in the Stone (1988). The Charles Heatherly Photographic Collection consists of 128 original color 35mm slides of North Carolina courthouses. Images of all 100 of the state’s courthouses are in the collection. The photographs were made in the mid-1980s. All of the photographs are exterior views. William Emsley Hipp III graduated from the University of North Carolina at Charlotte in 1974 with degrees in drama and sculpture. During his brief career, he was awarded a number of prestigious commissions to create sculptures of some of North Carolina’s most distinguished citizens. The materials consist of photographs, most of which are William Emsley Hipp’s working photographic portraits of persons commissioned for busts and images of his finished pieces made between 1976 and 1985. Also included are manuscripts, drawings, and paintings on paper related to the sculptures. Many of the subjects of his works have connections to the University of North Carolina at Chapel Hill. Included are former United States Senator Sam J. Ervin Jr., North Carolina legislator Thomas J. White, North Carolina Supreme Court Justice William H. Bobbitt, playwright Paul Green, director of the Institute of Government and law professor Albert Coates, UNC-Chapel Hill alumnus Roger N. Kirkman, and basketball coach Dean E. Smith. William Picard Jacocks, native of Bertie County, N.C., was a physician. He was a graduate of the University of North Carolina (BA), the University of Pennsylvania (MD), and Johns Hopkins University (Doctor of Public Health). After 1914, Jacocks was associated with the Rockefeller Foundation and spent much of his career in Asia, including India and Ceylon (now Sri Lanka), working on eradicating hookworm infections and other health issues. He retired in 1942 and moved back to Chapel Hill, N.C., where he was active in alumni affairs and family genealogy research. The collection consists of images of historic homes in Bertie, Brunswick, Dare, Hyde, Orange, and Perquimans counties in North Carolina. Some of the Orange County images were taken in Chapel Hill at the University of North Carolina. Included are images of the Jacocks family home in Perquimans County and images of locations relating to various historical associations and other groups around the state. The collection consists of images taken by Dudley L. Jennings (1913-2005), an amateur photographer from Lumberton, N.C., chiefly from the late 1930s through the late 1980s. Included in the collection are images of Colonial Williamsburg, Va., Charleston, S.C., Yosemite National Park, Calif., and locations throughout North Carolina, along with other miscellaneous subjects. The collection consists largely of black-and-white 120 and 35mm roll film, with some black-and-white sheet film and 35mm color slides. Also included are black-and-white photographic prints mounted for exhibition. Elmer D. Johnson attended the University of North Carolina in Chapel Hill, N.C., from 1932 to 1951, receiving a BA (1936), MA (1942), and PhD (1951) all in history. Johnson did not take the images contained in this collection, but received them in 1942 from an unidentified fellow student who was leaving UNC to serve in World War II. The collection consists of 15 prints mounted in a small leather album and 12 loose photographs. Imprinted on the front of the album are the words “Snap Shots,” and “Chapel Hill, N.C.” (handwritten in pen). All of the photographs appear to have been made on the campus of the University of North Carolina in Chapel Hill between the years 1940 and 1942. Included are images of the Louis Round Wilson Library (exterior and interior), the Morehead-Patterson Memorial Bell Tower, South Building (exterior), Emerson Playing Field, and student Paul Hayes Etheridge Jr. in a Pettigrew Hall dorm room. Francis “Frank” Lavergne Johnson (1901-1971) owned and operated the Lavergne of Chapel Hill photographic studio for nearly 30 years. He began his career in photography during World War II, working as a photographer for the United States Navy. Johnson visited Chapel Hill, N.C., on assignment in 1945 to take photographs of the United States Navy Pre-flight School at the University of North Carolina. When the war ended, he and his wife Mary moved to Chapel Hill and opened the Lavergne studio in downtown Chapel Hill. The studio remained in operation until Johnson’s death in 1971. During the nearly three decades that the studio was in operation, Johnson photographed countless residents of Chapel Hill and surrounding areas, including many people affliated with the University of North Carolina. The collection includes about 1,860 taken by Francis Lavergne Johnson between 1948 and 1971 in Chapel Hill, N.C. Included are portraits of many important figures connected to the University of North Carolina and the Chapel Hill community, including William B. Aycock, Katherine Kennedy Carmichael, William D. Carmichael Jr., Albert McKinnley Coats, Robert A. Fetzer, William C. Friday, Roland Giduz, Gordon Gray, Paul Elliot Green, Robert B. House, Charlie Justice, Josephina Niggli, Jerrold Orne, Paul F. Sharp, J. Carlyle Sitterson, and Louis Round Wilson. There are a few images of Chapel Hill High School and the Chapel Hill Post Office. Frances Benjamin Johnston (1864-1952) was a trained artist who turned her talents to photography and became one of the first prominent female photojournalists in the United States. After studying art at the Académie Julian in Paris, France and at the Art Students’ League in Washington, DC; Ms. Johnston took up an interest in journalism and began doing illustrations for newspapers in 1885. She eventually turned to photography because she thought it was “the more accurate machine” and studied under Thomas William Smillie, head of the Division of Photography at the Smithsonian Institution. During her long and successful career Johnston took tens of thousands of photographs of scenes and events all over the United States with an emphasis on Maryland, Virginia, North Carolina, South Carolina, Georgia, Florida, Alabama, Mississippi, and Louisiana. The Frances Benjamin Johnston (1864-1952) Collection contains photographs made between 1935 and 1938 of historic structures of architectural interest throughout North Carolina. Many of the photographs in this collection subsequently appeared in The Early Architecture of North Carolina by Frances Benjamin Johnston and Thomas T. Waterman. Jack (John) J. Kearins (1915-1993) of Raleigh, N.C., was an agent with the United States Bureau of Alcohol, Tobacco, and Firearms (ATF) and spent most of his career working in North Carolina. The collection consists of negatives and prints, circa 1936-1990, collected by Jack J. Kearins during his tenure with the United States Bureau of Alcohol, Tobacco, and Firearms (ATF). Many of the photographs document illegal liquor stills in the state of North Carolina and their destruction by ATF agents. The collection also contains a copy of Kearins’ 1969 book, Yankee Revenooer. Kay Kyser and Georgia Carroll Kyser were both graduates of the University of North Carolina and long-time residents of Chapel Hill. James Kern Kyser (Kay Kyser) was born in 1905 in Rocky Mount, N.C. He attended the University of North Carolina, 1923-1927, where he was the leader of the cheerleading squad. He is best known as a big band leader and as the “Ol’ Professor” on the radio show Kollege of Musical Knowledge. In 1944, Kyser married model, actress, and singer Georgia Carroll of Blooming Grove, Tex., who had joined the radio show in 1943. In 1951, he and his family retired to Chapel Hill, N.C. Through the Kyser Foundation, Kyser gave scholarships to students of music and dramatic art at the University of North Carolina. He was also instrumental in improving health care in North Carolina, starting the state’s public television station, and establishing a highway safety program. Kyser was active in the Christian Science Church, directing the church’s radio and television broadcasting division at the Boston headquarters in the 1970s, lecturing, and serving as national honorary president in 1983. The collection comprises approximately 335 images related to the lives of Kay Kyser and Georgia Carroll Kyser. Most of the materials depict Kay Kyser’s musical carreer before he returned to Chapel Hill. Charles “Charlie” Sidney Killebrew Jr. (1921-2009) photographed Rocky Mount and the surrounding areas of North Carolina for nearly 60 years. A native of Tarboro, N.C., Killebrew developed an interest in photography while serving in the United States Army Air Corps during World War II. Upon his return to the United States in 1946, he accepted a position as a photographer for the Rocky Mount Evening & Sunday Telegram. He remained with the newspaper for over 50 years. In 1952, he opened the Killebrew Photography Studio, a private photographic studio. In 1956, he opened Carolina Aerial Mapping and managed the two photographic businesses together for the next four decades. Killegrew continued to have an interest in photography until his death in 2006. The collection includes about 470,000 images taken by Charles S. Killebrew between 1948 and 1997 chiefly in Nash County, Edgecombe County, and surrounding areas of North Carolina. Included are images of local, state, and national politicians and political events; news events; Rocky Mount businesses; civic groups and other organizations; Nash County and Edgecombe County schools; sporting events; and other images that document daily life in North Carolina. Of particular interest are images of presidential visits; civil rights protests; natural disasters; and local celebrities, including musician Kay Kyser and basketball star Phil Ford. Jock Lauterer of Chapel Hill, N.C., is a photojournalist and educator who teaches community journalism, photojournalism, and newswriting classes at the University of North Carolina at Chapel Hill, from which he received his undergraduate degree in 1967. He is the founding director of the Carolina Community Media Project, an outreach initiative in the School of Journalism and Mass Communication. Prior to returning to his alma mater in 2001, he created and ran the photojournalism program at Pennsylvania State University. The collection is predominantly composed of images of the University of North Carolina at Chapel Hill and the town of Chapel Hill, N.C., made from circa 1964-1968, when the photographer was an undergraduate student at UNC. The largest grouping of negatives documents the UNC Men’s Glee Club European Tour of 1966. Other images portray life in Chapel Hill, the UNC campus, and university activities. Lauterer captured small-town life; the serenity of campus; sporting events; and the effects of politically charged times on a small community, including anti-war protests, Speaker Ban protests, civil rights marches and speeches, and a Ku Klux Klan rally. Many of the images include persons of national or local significance. Stephen Liu received his AB in chemistry with a double major in economics in May 1998 and his MD in 2002, both from the University of North Carolina at Chapel Hill. In addition to his studies, Liu was a photographer for the Yackety Yack, the University’s yearbook. The Stephen Liu Collection consists of 32 black-and-white and color photographs, 1998-2002, that depict men’s and women’s athletics; commencement ceremonies; student military, musical, and leisure activities; and various other aspects of student life at the University of North Carolina at Chapel Hill. Albert Lockhart was an African American enlisted soldier in the United States Army (82nd Airborne) stationed at Fort Bragg, N.C. in 1961. While stationed at Fort Bragg, Lockhart was a member of a Parachute Field Artillery Battalion. The collection consists of a photographic album created by Albert Lockhart while stationed at Fort Bragg between March and September of 1961. Images depict training excercises Lockhart participated in while training for the 82nd Airborne Division, Parachute Field Artillery Battalion (187?) in 1961 at Fort Bragg, N.C. Images also depict living conditions of service members and African American and white service members training, living, and relaxing together. Materials include both black-and-white and color photographic prints. The Loeb family immigrated to the United States from Germany in the 1930s after the Nazi rise to power. Together with other families of European Jews, the Loeb family moved to the Van Eeden settlement in Pender County, N.C., in 1939. The Van Eeden settlement was founded by Alvin Johnson of New York City, N.Y., and Hugh MacRae of Wilmington, N.C., to provide farmland for European Jewish refugees. Manfred Loeb was one of two sons. He worked on the farm and attended school in Penderlea, N.C. In the 1940s, the Loeb family moved to Bridgeport, Conn., where Manfred Loeb apprenticed as a baker. In 1948, he married Ann Wolf, whose family had also lived in the Van Eeden settlement. The Loebs eventually moved to Washington, D.C., where they operated a successful bakery for many years. The materials in this collection relate to life in the Van Eeden settlement for the Loeb and other families. Most of the photographs were taken shortly after the families moved to Van Eeden and include images of members of the Loeb, Heimann, and Wolf families in their homes and working in the fields, and of the children of these families attending school. Also included are letters collected by researcher Susan Block that relate memories of life and events at Van Eeden. There are also some newspaper clippings about Manfred and Ann Loeb. Edwin Martin began taking photographs in 1980. His North Carolina subjects, taken 1990-1995, include coastal areas, tobacco farming, and Wake County historic buildings. The collection contains images made by Edwin Martin in North Carolina that document people/places/scenes on Harkers Island, Bogue Sound, Shackleford Banks, all in Carteret County; production of tobacco (Franklin, Johnston, and Wake counties); and historic buildings in Raleigh (Wake County). Ben Dixon MacNeill wrote for several North Carolina newspapers, including the Wilmington Star-News and the Raleigh News and Observer. He also had an interest in photography and photographed events he was covering on assignment for the newspapers. He also captured other images of scenes and people around North Carolina. MacNeill retired from the newspaper business in the 1940s and moved to Cape Hatteras, N.C., where he served as publicity director for the Lost Colony dramatic production, wrote several books on the people of eastern North Carolina, and periodically contributed stories and images to regional newspapers. He died in 1960 at his home in Buxton-at-Hatteras, N.C. The collection includes 2144 images of events, scenes, and people in North Carolina. Included are many images of people and scenes around Cape Hatteras and Dare County. There are also images of the 1923 dedication of the Wright Brothers Memorial at Kitty Hawk, including a few images of Amelia Earhart and Orville Wright; the 1927 celebration of the Battle of Bentonville; the 1925 Cumnock coal mine disaster in Lee County; the 1923 Spruce Pines riot; the 1928 inauguration of Governor Max Gardner; images taken in the 1920s during prohibition; and early images of the planning for the Blue Ridge Parkway and other events across North Carolina. Edward Johnson McCauley (1926-2003) was a photojournalist and life-long resident of Burlington, N.C. He spent more than 20 years on the staff of the Burlington Daily Times-News, covering a wide variety of events in Burlington, across Alamance County, and in other parts of North Carolina. He was also a professional portrait photographer, photographic developer, and framer. The collection contains photographic material created by Edward J. McCauley between the years 1949 and 1974, mostly for the Burlington Daily Times-News, but also as a private photographer and developer (portraits, weddings and other events). Included are images of local, state, and national politicians and political events; news events; Burlington businesses; civic groups and other organizations; Alamance County schools; sporting events; and other images that document daily life in North Carolina. Most of the images are from Burlington and Alamance County, but many other North Carolina localities are also represented. Adeline Denham McCall (1900-1989) of Chapel Hill, N.C., was a teacher of music and music appreciation. She taught music education and music history at Duke University and served as music supervisor of the Chapel Hill-Carrboro City Schools for 30 years. At the University of North Carolina at Chapel Hill she taught music for students interested in early childhood education. She authored or co-authored several books and worked closely with the North Carolina Symphony in its outreach program. The photographs in the collection relate to Adeline Denham McCall’s work with the North Carolina Symphony and the promotion of music in the public schools. Images of school children and school classrooms include one photograph of African American children at the Orange County Training School. Individuals pictured in the collection, in addition to Adeline Denham McCall, include her husband Fred McCall, Almonte Howell, Margaret Shaw, and Leonard Bernstein. A collection of unrelated iconographic materials of miscellaneous subject content. Most of the images cannot be identified with regard to precise geographic localities in North Carolina. A few relate to more than one location or to localities outside North Carolina. Primary subjects appear as subject access points; more detailed subjects appear in the contents list. Earl Nelson Mitchell (1926-2011) was a professor of physics at the University of North Carolina at Chapel Hill from the early 1960s until his retirement in 1991. He is author of the photographic textbook, Photographic Science (1984), and co-taught with Ross Scroggs the course, Physics 45: Photography. He and his wife Marlys founded Mitchell Winery located outside of Chapel Hill, N.C., in 1971 and were instrumental in the founding of the North Carolina Winegrowers Association. This collection consists of black-and-white and color 35mm slides taken by Mitchell between 1967 and 1986. Photographs were taken in a number of different locations, mainly in North Carolina, and depict people, events, landscapes, nature scenes, and buildings; many of the images in his writings and instruction of scientific photography. Many of the images were taken on the campus of the University of North Carolina at Chapel Hill. Also included are images taken by Mitchell as he traveled to different locations across the United States and around the world. Numerous images of Mitchell’s family-owned vineyard (Mitchell Vineyard) and other vineyards he traveled to in the United States, France, and Italy are included in the collection. The collection also includes Mitchell’s photographic logs created by Mitchell, that extensively detail the location and specifications of almost 6000 images he took from 1967 to 1985. Kenneth N. Montgomery attended the United States Navy Pre-Flight School at the University of North Carolina in Chapel Hill, N.C., 1942-1943. This collection consists of black-and-white photographs taken by Montgomery during his time at the Pre-Flight School. Photographs depict scenes of training, recreation, dorm life in Stacey Hall, and campus and town views in Chapel Hill, N.C.. Also included are photographs of the Naval Air Facility in New Cumberland, Pa., and postcards of Montreat, N.C.
Rufus Morgan, a portrait and stereograph photographer, was born in Virginia in 1846 and died in California in 1880. He spent much of his adult life in North Carolina and operated studios at several locations across the state, including New Bern, Goldsboro, and Raleigh. Morgan’s photographs were taken mostly in North Carolina, but he also traveled to South Carolina, Georgia, Florida, New York, and California. The collection consists of more than 350 individual stereographs, 316 stereographs mounted in the Illustrated Catalogue of Southern Scenery by Rufus Morgan, several photographic prints, and some documents related to Morgan’s portrait business. Morgan took a majority of the images in this collection and collected the rest between 1869 and 1880. Included are images taken in different parts of North Carolina, California, Florida, Georgia, New York, and South Carolina. The materials also include images of Davidson College; Oakwood Cemetery in Raleigh, N.C.; the North Carolina Military Institute in Charlotte, N.C.; the Oxford Orphanage in Oxford, N.C.; the Simonton Female College in Statesville, N.C.; St. Mary’s College in Raleigh, N.C.; Yosemite Valley; Elisha Mitchell’s gravesite; William J. Clarke; and Braxton Bragg. Hugh MacRae Morton (1921-2006) was a prominent North Carolina businessman, political figure, tourism booster, conservationist, environmental activist, sports fan, and prolific image-maker. The still images and motion pictures in the collection cover Morton’s career of eight decades, 1930s-2000s, and document his varied involvements as a photojournalist; a soldier in the Pacific Theater during World War II; the owner and operator of the Grandfather Mountain tourist attraction in Linville, N.C.; a promoter of travel and tourism in North Carolina and the Smoky Mountains region; a well-known figure in state government and friend of many North Carolina politicians, entertainers, and media; a student, booster, and frequent sports-event attendee of the University of North Carolina at Chapel Hill; and an ardent admirer of nature. A detailed inventory of film and audio-visual materials in available as a PDF file linked from the finding aid. William Starr Myers was born on 17 June 1877 in Baltimore, Md. In 1890, the Myers family moved to Asheville, N.C. William Starr Myers received his A.B. degree from the University of North Carolina in 1897 and his Ph.D. from Johns Hopkins University in 1900. At the University of North Carolina, Myers was active in several organizations and wrote the words for “Hail to the Brightest Star,” which evolved into the University of North Carolina alma mater, “Hark the Sound.” Myers was assistant professor and preceptor at Princeton University, 1906-1918, then a professor at Princeton from 1918 until his death in 1956. The images in this collection consist primarily of William Starr Myers and his family, including portraits and outdoor group scenes. Also included is an ambrotype portrait of an African-American man identified as “Uncle Jed (or Jerry)? last slave of the Morford family” holding a young white girl identified as Elizabeth Morford. The North Carolina Botanical Garden is an administrative unit of the University of North Carolina at Chapel Hill. The Garden has been a leader in native plant conservation and education in the southeastern United States for more than 40 years. The collection contains images that document the activities of the North Carolina Botanical Garden in Chapel Hill, N.C. It contains photographs of gardening activities, classes, site cleanup, and a meeting of the North Carolina Wildflower Preservation Society. Individuals pictured in the collection include Henry Roland Totten (1892-1974), Ken Moore, and others associated with the Garden, 1966-1980. Image reference cards relate to frequently requested, popular, and important images from the North Carolina Collection Photographic Archives, the North Carolina Collection, and a few private collections not held in Wilson Library Special Collections. They were compiled by members of the North Carolina Collection reference staff starting in 1970 and ending in 1990. The collection consists of cards containing reference copies of selected images, chiefly 1839-1980, and information related to content and origination of each image. Most of the items come from collections in the North Carolina Collection Photographic Archives and the North Carolina Collection. Each index card includes information about a copy negative made of a photograph or printed item. Most cards also include a contact print of the image, as well as the approximate date, subject, photographer or source, and some indication of provenance. The images are in four alphabetical runs: North Carolina counties; portraits; University of North Carolina at Chapel Hill; miscellaneous subjects; and printed items, which include reproductions of book covers, book title pages, maps, pamphlets, engravings, newspapers, and journals. The collection consists of images depicting places, events, and people in each of North Carolina’s 100 counties. The collection is organized into two series by format and arranged within each series according to county. Images are primarily black-and-white photographic prints and film negatives. The North Carolina Department of Public Instruction is the North Carolina state government agency charged with implementation and enforcement of state-wide education policies and procedures. The collection consists of 276 color 35mm slides made circa 1970 that are organized by North Carolina geographical regions and subject themes. The slides were originally used in presentations. Also included are 171 note cards describing the slides’ subject matter. Subjects include tobacco; general North Carolina locations; historic sites and other structures; and the coastal, Tidewater, Piedmont, and mountain regions. The collection consists of digital photographs taken by winners of the North Carolina Documentary Photography Award, 2012-2015. The North Carolina Documentary Photography Awards is an annual program available to University of North Carolina at Chapel Hill undergraduate and graduate students and is sponsored by the North Carolina Collection in Wilson Special Collections Library. The photographs depict a variety of subjects in different locations across North Carolina, and cover a variety of topics including immigration, farming, economic change, Gullah culture and religious gatherings, and North Carolina businesses. Ben Moore Patrick was working as a writer and photographer for the Durham Herald-Sun when he took the images in the collection between October 1941 and May of 1942. His goal was to document the landscapes, peoples, and communities that would be directly impacted by the construction of Camp Butner in Granville and Durham counties, N.C. The collection consists of black and white photographs taken by Ben Moore Patrick in different areas of Granville and Durham counties, N.C. Patrick took the images between October 1941 and May 1942 before construction began on Camp Butner, a United States military facility built in the area during World War II. The images document the rural communities and residents displaced by construction of the camp. The collection includes a few early construction scenes at the camp, but most of the images are of homes; farmlands; farm buildings; railroads; churches; and residents, some of whom were African Americans. C. Ford Peatross is Curator of the Center for Architecture, Design, and Engineering in the Prints and Photographs Division of the Library of Congress and the Center for American Architecture, Design and Engineering in Washington, D.C. He was a former graduate student in the Department of Art at the University of North Carolina at Chapel Hill. Among his writings, Peatross co-authored William Nichols, Architect with Robert O. Mellown, published by the University of Alabama Art Gallery in 1979. William Nichols was born in Bath, England and immigrated to New Bern, N.C., in 1800 and established himself as an architect. He was the state architect for North Carolina from 1817 to 1826, and was state architect or engineer for Alabama, Louisiana, and Mississippi as well. The collection consists of 402 photographs (copy prints and original photographs) made primarily by C. Ford Peatross intended as illustrations for a dissertation, which was never completed, on architect William Nichols (1777-1853). The majority of the images are of structures and buildings in North Carolina, but there are also images of structures in England, Alabama, Illinois, Maine, Massachusetts, New Hampshire, Pennsylvania, Virginia, and Washington, D.C., that were designed by Nichols or that influenced his work. A majority of the images in the collection are copy prints made by Peatross of materials from the Historic American Buildings Survey (HABS) and the Historic American Engineering Record (HAER) collections at the Library of Congress in Washington, D.C. Original photographs taken by Peatross have been identified and copy work includes citations from original sources. A collection documenting more than 3,500 persons, most of whom have a connection to the state of North Carolina. The collection is arranged by surname and forename. This is an artificial collection created by the North Carolina Collection at the University of North Carolina at Chapel Hill from postcards donated over a period of decades. The collection consists of picture postcards dating from circa 1905 to the present arranged by North Carolina county name. Postcards of miscellaneous mountains and miscellaneous scenes of North Carolina are filed at the end. Within some counties additional subdivisions exist by city/town or topic. All 100 of North Carolina’s counties are represented in the collection. William W. (Bill) Prouty moved with his family to Chapel Hill as a child in 1919. He graduated from Chapel Hill High School, Oak Ridge Military Institute, and the University of North Carolina in Chapel Hill, N.C. Prouty worked as a sportswriter, columnist, and photographer for The Chapel Hill Weekly and The Chapel Hill Newspaper. He died on 23 January 1996. The collection consists of approximately 7,500 images documenting community organizations; events; businesses; churches; schools; sports teams; newsworthy people of local and national significance; and scenes and activities in and around the towns of Chapel Hill, Carrboro, and Hillsborough in Orange County, N.C., between 1955 and 1961. The collection also contains some images of the University of North Carolina, including a set of 35mm color copy slides of the October 1961 University Day visit of President John F. Kennedy. A few North Carolina coastal and mountain locations are also depicted. Images depict railroad stations in over 40 counties in North Carolina and consists of photographic prints made from images taken by unidentified photographers. Materials are arranged by location, and many descriptions include the name of the railroad company that owned or managed the stations. Alfred Eric Stepney was an African American enlisted soldier in the United States Army stationed at Fort Bragg, N.C., in 1942. He was from White Plains, N.Y. The collection consists of a photographic album and several loose black-and-white prints. Many of the photographs appear to have been taken outside the barracks at Fort Bragg in 1941 or 1942, and include African Americans and a few white people. Other prints, some apparently from an earlier date, include family and friends in unknown locations. Also included is an undated Fort Bragg “Pass Card” for E.A. Stepney. Stereograph images are composed of two images placed side by side. When viewed through a stereoscope or another similar device, the images appeared three-dimensional. After 1850, these images were frequently produced on cards that could be sold commercially. The collection consists of 69 stereograph cards made in North Carolina from circa 1870 to circa 1904, some of which depict scenes at the University of North Carolina. Also included are a number of stereocards made outside of North Carolina. William Jasper Stimson (1860-1929) and his son, Benjamin Alston Stimson (1893-1969), were professional photographers based in Statesville, N.C. William Stimson moved to Statesville in 1890 to set up Stimson Studio which was later run by Benjamin Stimson. Benjamin Stimson served in World War I, working as an X-ray technician at Base Hospital 45 in Autun, France, in 1918. The collection includes images made by William Stimson, 1890s-1920s, and by Benjamin Stimson, 1915-1960s. Images taken by William Stimson depict scenes in and around Statesville, N.C., including the Bostian Bridge train wreck, as well as portraits of local individuals, among them Dr. J.A. Scott in his office at Mitchell College and an unidentified African American family. Images made by Benjamin Stimson include scenes in and around Statesville, N.C., including Mitchell College, local businesses, and a bank robbery in Taylorsville, N.C. Also included are images made during Benjamin Stimson’s service in World War I as an X-ray technician at Base Hospital 45 in Autun, France, depicting the hospital, soldiers, medical personnel, scenes in and around the town, and local citizens. Lamar Stringfield (1897-1959) was a North Carolina native and an accomplished composer, conductor, musician, and teacher. Stringfield studied and composed music based on American folklore and worked with many music ensembles, including symphony orchestras, chiefly in North Carolina. The collection consists primarily of images of Lamar Stringfield, including some of Stringfield conducting. Also included are images of Stringfield’s family and friends; Asheville, N.C.; nature scenes; and events. Don Sturkey (b. 1931) retired as chief photographer of the Charlotte Observer in 1989 after 34 years. The native of Lincoln County, Ga., arrived at his profession by chance; Sturkey joined the United States Navy in 1948 and was assigned to shore duty in Washington. He repeatedly asked to be transferred, including to photography school, and in early 1950 he was granted this opportunity. Sturkey went on to be the first staff photographer at the Shelby Daily Star and worked there for one summer. He attended Gardner-Webb College in Boiling Springs, N.C., and joined the staff of the High Point Enterprise following college. Sturkey began working at the Charlotte Observer in November of 1955. This collection comprises the photographic materials made by Don Sturkey from 1951 to 2007, the majority of which he produced in his capacity as staff photographer for the Charlotte Observer (1955-1989). Primarily depicted are local news and sports events covered by Sturkey. He captured numerous images portraying the tense racial climate of the time, including Ku Klux Klan meetings and rallies; blacks and whites picketing segregated establishments; a lottery drawing for school integration in the Charlotte and Mecklenburg County public schools; and Dorothy Counts, the first black student to attend Harding High School in Charlotte in 1957. Also included are many images of the civil rights leaders of the 1950s and 1960s, numerous North Carolina and United States politicians, famous musicians and entertainers, several NASA missions, and the construction of Walt Disney World in 1971. John H. Tarbell (1849-1929) was a photographer who operated a studio in Asheville, N.C., between 1896 and 1901. Originally from Massachusetts, Tarbell returned to New England around 1902 and remained there until his death in 1929. The collection includes 68 images taken by John H. Tarbell between 1897 and 1907 (bulk 1897-1901). A majority of the images are believed to have been be taken in Asheville, N.C., and surrounding areas. Images include the Biltmore Estate, which at that time was the private residence of George Vanderbilt, and people and residences believed to be in the vicinity of Asheville, N.C. Tarbell’s images depicting African Americans in the southern parts of the United States were widely published during the early part of the twentieth century and appeared in publications including Cosmopolitan and New England Magazine; however, the collection contains none of those published images and only one image of an African American woman who may be Ms. “Aunt” Betsy Washington, whom Tarbell photographed/interviewed for an article in New England Magazine. Tintypes were in production from the late 1850s into the early 1900s. This format (also known as a ferrotype) was invented in the United Sates by Hamilton L. Smith in 1856. The process by which the images were developed was based on the “wet collodion” process used to produce ambrotypes. The process was quick and cheap, when compared to ambrotypes, and was extremely popular from 1856 till they fell out of use in the early 1900s. The Tintype Collection contains 19 images taken of individuals seated or standing for portraits, circa 1856-1900. Individuals appearing in the images have been identified whenever possible. Known individuals are listed as subject access points, as are identified locations. Few of the images remain in their original paper encasements due to their fragility. Included are an images of the Carroll family of Danbury, N.C.; a slave referred to as “Uncle Caesar,” who was owned by the Roulhac family of Hillsborough, N.C.; graduation marshals at the University of North Carolina in 1861; and Henry Speck Harris (1837-1863) of the “Flat River Guard” Company B, 6th North Carolina Infantry Regiment. The North Carolina Department of Community Colleges was established in 1963 by order of the North Carolina General Assembly. The creation of the North Carolina Department of Community Colleges established a unified administrative body for the state’s community colleges and technical institutes. The collection consists of a report created by the North Carolina Department of Community Colleges for North Carolina Governor Dan K. Moore in 1966. The collection includes photographs related to vocational training programs at North Carolina community colleges and technical institutes. Also included is correspondence from industry leaders to the heads of North Carolina community colleges and technical institutes regarding the quality of training received by alumni employed in a variety of industries. Images taken by Gary E. Trawick depicting scenes made in the 100 county seats of North Carolina between 1993 and 2016. Images chiefly depict courthouses, police stations, and general scenes in the county seats. Also included are notes written by Trawick, reflecting on his visit to many of the locations represented in the photographs. Tryon Palace was originally completed in 1770 in New Bern, N.C., which served as the first capitol of North Carolina. Tryon Palace was the residence for the governor and his family. The original building burned in 1798. Early in the 20th century, a major effort began to re-construct the original palace. The renovated Tryon Palace re-opened in 1959. The collection includes an album of photographs prepared for North Carolina Governor William B. Umstead relating to the reconstruction and restoration of Tryon Palace at New Bern. The album is dated September 1954 and includes maps and photographs of the area around Tryon Palace during the early stages of construction. Doris Ulmann (1882-1934) was a “pictorialist” photographer based in New York City, N.Y., renowned for her portraits of both prominent figures in New York City and of people from the rural South. Ulmann attended the teacher training program at Felix Adler’s Ethical Culture School, and enrolled in psychology, law, and photography classes at Columbia University, all located in New York, N.Y. She graduated from the Clarence H. White School of Photography in New York City, N.Y. After established herself as a portrait photographer in New York City, she increasingly turned her attention to photographing rural southerners and members of Appalachian mountain communities, to whom she referred affectionately as her “mountaineers.” In 1929, Ulmann began her collaboration with Pulitzer-Prize winning novelist Julia Peterkin on the widely-acclaimed Roll, Jordan, Roll, a book documenting African American folk culture in South Carolina’s Gullah coastal region. Ulmann continued photographing rural communities until her death in 1934. This collection contains five black-and-white photographic prints reflecting Ulmann’s interest in Appalachian communities, including a photograph of a spring house in Peachtree, N.C., and two portraits of residents of South Turkey Creek, N.C.. Also included are two images taken at the John C. Campbell Folk School in Brasstown, N.C., which acted as Ulmann’s headquarters during her work taking illustrative photographs for Allen Eaton’s Handicrafts of the Southern Highlands, which was published after Ulmann’s death in 1937. The Farmers’ Institute appears to have been an organization active in the early 1900s as part of the United States Department of Agriculture. The collection consists of about 100 lantern slides identified as having been created for lectures of the United States Department of Agriculture’s Farmers’ Institute. Slides for two lectures are included, with each slide identifying the lecture number and author(s), the slide number, and an original negative number of unknown significance. Most of the images depict farmhouses, but there are also images of farmland and people, as well as a sketch of a farmhouse and part of a poem. None of the images are credited or identified as to location. The United States Department of Agriculture (USDA) is a federal agency, responsible for creating and enforcing public policy regarding food, agriculture and forestry within the United States. The Oxford Tobacco Research Laboratory was established in 1910 in Oxford, N.C., as a facility for research on tobacco production. The collection includes images, made by the USDA, depicting tobacco plants and production research at the Oxford Tobacco Research Laboratory in Oxford, N.C. The United States Navy Reserve Officers Training Corps (ROTC) was established in 1926 as a training program on college campuses in preparation for service in the United States Naval Reserve. The University of North Carolina at Chapel Hill established a Navy ROTC unit in 1940, training students for service in the United States Navy and Marine Corps. The Navy ROTC program continues to train and prepare students for military service on the campus of the University of North Carolina at Chapel Hill. The collection includes 1,562 images depicting activities of the University of North Carolina at Chapel Hill Navy ROTC from 1941 to about 1985, including training, sailing, social and ceremonial events, awards, and graduating classes. Also included are images depicting aircraft carriers, battleships, and other naval watercraft and vehicles. In February 1942, the United States Navy announced the establishment of a pre-flight school to train naval pilots on the campus of the University of North Carolina in Chapel Hill, N.C. The University hosted the second stage of a one-year training program for the servicemen. Cadets began arriving in May 1942 at the rate of about 300 every two weeks until a quota of 1,875 was reached. The program graduated its first class in October of that year. To accommodate the influx of servicemen, the University renovated ten dormitories, expanded Woollen Gymnasium, and built a new infirmary, recreation center (Navy Hall), and athletic field. The Pre-Flight School closed in 1945. The United States Navy Pre-Flight School Photographic Collection consists of approximately 6,000 negatives made by United States Navy photographers. The images document the work of the Pre-Flight School, including both training and social activities. Included are photographs of the Pre-Flight School’s African American band that played at campus and community events. The band toured in the Pacific in 1944. The collection consists of images documenting the history of the University of North Carolina at Chapel Hill organized into eleven series by broad categories: administration and staff, 1897-1980s; alumni, 1900-1979; athletics, 1890s-1999 and undated; buildings and grounds, 1799-1999 and undated; documents, 1950s and undated; keepsakes, 1980s-1990s and undated; military affairs, 1910-1980s and undated; organizations, 1878-1990s and undated; schools and colleges, 1870-1980s; special events, 1910s-1980s; and students, 1870-1990s. Images are in a variety of formats, primarily black-and-white photographic prints, but also including film negatives, 35mm color slides, 35mm roll film negatives, illustrations, color lithographs, pages from publications, and other types of documents. The crosslisted course American Studies 60/Folklore 195 was taught between 1990 and 1997 and again in 2008 and 2009 by Professor William Bamberger at the University of North Carolina at Chapel Hill in Chapel Hill, N.C. The collection consists of images (photographic prints and negatives) taken by AMST 60/FOLK 195 students between 1990 and 1997 as well as 2008-2009 in various North Carolina locations, and covering various topics such as rural life, farming, city and town life and institutions, religious gatherings, and local businesses. The University of North Carolina at Chapel Hill celebrated the bicentennial of its founding in October 1993. The two chief photographers represented in this collection are Dan Sears and Rick Beckman. Sears has served as the official University of North Carolina at Chapel Hill photographer since 1992. He has also worked for several newspapers, United Press International, and the Associated Press. Beckman began his career as a photojournalist and taught for 30 years at the University of North Carolina at Chapel Hill School of Journalism and Mass Communication. The collection documents the bicentennial activities at the University of North Carolina at Chapel Hill in October 1993. The majority of the images were taken by Dan Sears and Rick Beckman, but the work of a few other UNC staff photographers is also included. Most of the images date from October 1993, but a few were taken on other dates. The Department of Dramatic Art at the University of North Carolina was established in 1936; prior to that, instruction in the history of theater and comparative drama was given in the Department of English. In addition to academic instruction, the new department produced plays and supported dramatic efforts. The Carolina Playmakers, founded in 1918 by drama professor Frederick Henry Koch (1877-1944), became its production unit. Koch and the Playmakers specialized in folk drama and were considered seminal in the Little Theatre movement of the early 20th century. The group performed plays (many of which were written by students) on campus, and also toured North Carolina and other states. The Carolina Dramatic Association, begun in 1922, was a cooperative program of the Department of Dramatic Art and the University Extension Division’s Bureau of Community Drama. A new semi-professional theatrical group, the PlayMakers Repertory Company, was established in 1976. Many persons associated with the study of dramatic art at the University of North Carolina later achieved professional prominence, including Thomas Wolfe, Paul Green, Betty Smith, Shepperd Strudwick, Jack Palance, Louise Fletcher, Anne Jeffries, and Andy Griffith. The collection spans the time period from 1911 through the 1970s and includes photographs and related material documenting theatrical productions, personnel, tours, programs, events, and other activities of the Department of Dramatic Art. Images primarily document the Carolina Playmakers (1918-1975), and often depict Caucasian actors portraying African American, Native American, and Asian characters. Many of these early play images were taken and produced by the photographer Bayard Wootten or by Wootten-Moulton Studios. Productions and activities of the PlayMakers Reperatory Company, the North Dakota Playmakers (founded by Frederick Henry Koch in 1905 before he came to the University of North Carolina), and the Works Progress Administration’s Federal Theatre Project are also depicted. The collection consists primarily of photographic material (prints, negatives, and 35mm slides), but also contains programs from productions, notes on tour dates, reviews, and other materials. The Department of Pediatrics of the University of North Carolina was founded following the 1947 appropriation of funds by the North Carolina General Assembly for the construction of the North Carolina Memorial Hospital. The Hospital (renamed in 1989 as UNC Hospitals) opened in 1952, marking the expansion of the two-year medical curriculum into a full four-year school of medicine. In 2002, the Department of Pediatrics was relocated within the newly opened North Carolina Children’s Hospital at the University of North Carolina medical campus in Chapel Hill. The collection consists of images documenting the staff and activities of the University of North Carolina at Chapel Hill Department of Pediatrics from approximately 1952 through 1995. Many of the photographs appear in the 1996 book From Infancy to Maturity: The History of the Department of Pediatrics, the University of North Carolina at Chapel Hill, 1952-1995. Included are annual staff photographs; portraits; and photographs of patients, the Floyd W. Denny Pediatric Society of the University of North Carolina (Denny Society); the Ronald McDonald House of Chapel Hill; the Hospital School; and staff leisure activities. Also included are notes identifying individuals and events that correspondto many of the published images. The University of North Carolina at Chapel Hill Libraries’ Photographic Services unit existed from the early 1950s through 2006 and specialized in photographic processes (copy negatives and photographic prints), microfilm and microfilm duplication, still photography, positive microfilm printing, and other services for the University Library and other North Carolina libraries. The collection dates from 1976 to 2003 and consists of still images taken by Photographic Services employees, primarily documenting Library-related events and functions. Events depicted include conferences, meetings, North Caroliniana Society dinners, meetings of the North Carolina Writers Conference, awards banquets, visitors, staff retirement parties, and student protests. Many of the images include persons of national or local significance, especially authors. Some studio portraits of individuals (students and faculty) are also included. The University of North Carolina at Chapel Hill Library’s Photographic Services unit existed from the early 1950s through 2006 and specialized in photographic processes (copy negatives and photo prints), microfilm and microfilm duplication, still photography, positive microfilm printing, and other services for the University Library and other North Carolina libraries. The collection dates from 1977 to 2006 and consists of copy negatives created by Photographic Services staff members as part of the photographic reproduction process. The University of North Carolina at Chapel Hill Photographic Laboratory served the University community for almost half a century, from 1946 to 1990. The Laboratory processed (developed) film for University photographers and served as the image reproduction center for University offices, schools, departments, staff, and student activities. Thousands of the images in this collection appeared in a variety of University-related publications (including the Yackety Yack and The Daily Tar Heel) in addition to being used in official materials created to provide information about different departments, schools, and departments on campus. The Photographic Laboratory ceased operations in 1990. The majority of the collection consists of black-and-white photographic negatives and mounted “reference” photographic prints created by the Photographic Laboratory between 1946 and 1990. Subject matter includes faculty, staff, students, facilities, and activities at the University of North Carolina at Chapel Hill. The University sponsored School of Medicine was established in 1879 with a two-year medical curriculum. When the School of Medicine’s first Dean resigned from the University in 1895 to focus on his medical practice, the School of Medicine was closed. It remained closed until 1890, when it reopened with a one-year curriculum. The School of Medicine returned to a two-year curriculum in 1896. In 1947, the North Carolina General Assembly appropriated funds for the construction of the North Carolina Memorial Hospital. The hospital (renamed in 1989 as UNC Hospitals) opened in 1952, making possible the expansion of the two-year medical curriculum into a full four-year school of medicine by 1954. In 1998, the UNC Health Care System was established, bringing together UNC Hospitals and the School of Medicine under one entity. The University of North Carolina at Chapel Hill School of Medicine Photographic Collection contains photographic materials from approximately 1900 through the 1990s, with the bulk of the materials dating from the late 1960s to early 1970s. Included are images documenting graduating classes, students, faculty, alumni and alumnae, buildings, and activities related to the School. Images primarily depict individuals, classroom and laboratory activities, and events, and, to a lesser extent, work with patients in the hospital setting. Events include groundbreaking ceremonies and building dedications, lectures, conferences and symposiums, commencement ceremonies, Faculty Day, the Senior Banquet, and Parents’ Day. Photographers represented include William Brinkhouse, Dan Crawford, and William Burch. The University of North Carolina at Chapel Hill School of Public Health became the nation’s fourth school of public health and first public university school of public health when it was organized as part of the University of North Carolina School of Medicine in 1936. By 1939, the School of Public Health became a separate school within the University and began awarding its first degrees by 1940. In 2008, the school was renamed the University of North Carolina at Chapel Hill Gillings School of Global Public Health. The collection contains photographic materials, circa 1930s to 1990s. Included are images documenting the school’s faculty, students, staff, and alumni; formal and informal events and activities; and buildings and grounds. Some of the images appeared in publications. Events and activities include awards and ceremonies, conferences and meetings, community programs and medical practice, social events and celebrations, and school visitors. Images primarily depict individuals, events, and activities associated with the school, and, to a lesser degree, community programs and medical practices with members of the community. Materials are predominantly consist of black-and-white and color prints, but there are also black-and-white sheet film negatives, 120 black-and-white film negatives, 35mm black-and-white film negatives, 35mm color negatives, and 35mm color slides. The North Carolina chapter of the Sigma Alpha Epsilon fraternity was established at the University of North Carolina in 1857. Collection consists of photographic prints depicting members of the Sigma Epsilon fraternity, circa 1886-1920. Included in the collection are images of Edward Kidder Graham (class of 1898) and John Motley Morehead III (class of 1891). A photograph album containing photographs of the University of North Carolina’s 1907 senior class. The photographs were taken by Holladay Studio in Durham, N.C., who specialized in university and college groups. The album was originally owned by Quincy Sharpe Mills. Images contained in this collection are believed to have been used in a Paul Green documentary produced by The University of North Carolina Center for Public Television. The images depict various artists and performers appearing in programming produced by The University of North Carolina Center for Public Television during the 1970s. Tom E. Walters, Jr. (1930-1992) was a news and commercial photographer from 1955-1991 based in Charlotte, N.C. The collection chiefly consists of both black-and-white and color photographic negatives of various formats taken by Walters while on assignment for the Charlotte News and the Charlotte Observer (1950s-1960s), and during his career as a self-employed advertising photographer (1960s-1990s) based in Charlotte, N.C. Also contained in the collection are approximately 1,000 photographic prints, including the images that Walters entered into the Annual National Press Photographers Association (NPPA) Competition for the years 1958 through 1962. In addition to Walters’ photographic prints are tear sheets (printed examples of his work), magazines, and various other print materials featuring Walters’ images. Also included are printed materials, correspondence, and log books related to the operation of his photographic studio. Earlier materials primarily depict news and political events including civil rights sit-ins in 1958 and 1961, numerous North Carolina and United States politicians, and famous musicians and entertainers. Later materials feature regional businesses and organizations such as North Carolina National Bank (NCNB), Charlotte Country Day School (CCDS), the Mint Museum of Art, and Pentes Design. Notable individuals depicted in the collection include North Carolina Governor Luther Hodges, Jack Pentes, Bones McKinney, Harry Golden, and Carl Sandburg. Also included are numerous images featuring the Land of Oz amusement park in Beech Mountain, N.C., including location scouting, costume design, and the functioning park. Louanne Watley is a photographer and poet based in Chapel Hill, N.C. Her work has appeared in Carolina Quarterly, Calyx, and North Carolina Literary Review. This collection consists largely of photographic images taken between the late 1980s and the late 1990s. Images include both black-and-white and color photographic prints, black-and-white 35mm roll film and 120 roll film, and 35mm color roll film and slides. Included in this collection are images from Watley’s “Evelyn” series, along with other various subjects, largely taken in North Carolina and elsewhere in the southeastern United States. Also included in this collection are artist books created by Watley, along with commercial publications, advertisements, and articles relating to her work. Harry Legare Watson (1876-1956) graduated from the University of North Carolina in 1899 and went on to careers in law and journalism, chiefly in Greenwood, S.C. The collection consists of a set of portraits of Watson’s fellow members of the University of North Carolina Class of 1899. Dr. Bailey Daniel Webb, a descendent of the Webb family of the Granville, Person, and Orange counties area of North Carolina, was a student in the graduate school at the University of North Carolina in chemistry (1937-1939) and biochemistry (1939-1941). She was an early female graduate of Duke University School of Medicine (M.D., 1946) and then a pediatrician in private practice in Durham Co., N.C., 1949-1987. Webb was recognized with the University of North Carolina at Chapel Hill’s Distinguished Alumna Award in 1998. Her sister, Kate Webb Williamson, was a public health nurse in Granville County in the 1940s and later served as supervisor of public health nurses in Cumberland County, N.C. Kate Williamson was the recipient of UNC-Chapel Hill’s first Margaret Dolan Award in 1973. The Bailey Daniel Webb photographs date from circa 1885 to 1973 and consist of black-and-white photographic prints depicting Webb family members and family homes; students and faculty in chemistry, biochemistry and medicine at the University of North Carolina during the period from 1937 to 1941, when Bailey Webb was enrolled there; M.J. Rosenau of the UNC School of Public Health; and images of public health clinics, patients (African American women and children), and staff in Oxford, Berea, and Weldon, N.C., during the 1940s, when Kate Webb Williamson served in those areas as a nurse. Also included is an image from 1973 of Kate Williamson receiving the Margaret Dolan award from UNC-Chapel Hill. Louis Round Wilson (27 December 1876–10 December 1979) was born in Lenoir, N.C., and, in the 1890s, attended Davenport College in Lenoir; Haverford College in Haverford, Pa.; and the University of North Carolina in Chapel Hill, N.C., from which he graduated in May 1899. After teaching for a few years, Wilson embarked on a long and distinguished career in librarianship, library science education, and university administration. Wilson served as librarian and first director of the School of Library Science from 1901-1932 at the University of North Carolina, and dean of the Graduate Library School at the University of Chicago, 1932-1942. From 1901 to 1932, Wilson served on many University of North Carolina committees, developed collections, and oversaw the planning and construction of two of the University’s main libraries: the Carnegie Library in 1907 and the 1929 building that, in 1956, would bear his name. When he returned to Chapel Hill from Chicago in 1942, he resumed his many activities at the University, serving on numerous faculty and special University committees until he retired in 1959. He was a consultant to the president of the University from 1959 to 1969. The Louis Round Wilson Photographic Collection consists largely of snapshots of family and friends and some studio portraits, circa 1860s-1980s. Family snapshots include members of the Edmonds, Round, Wilson, and Wright families. Among the individual images are those of William C. Friday, R.B. House, and Thomas Wolfe. Most photographs were made in North Carolina (primarily in Chapel Hill), but a few were made in Chicago, New York, and elsewhere. Formats represented include black-and-white prints, color prints and negatives, silhouettes, a daguerreotype, ambrotypes, tintypes, a cyanotype, postcards, and cartes de visites. John Wallace Winborne (1884-1966), was a graduate of the University of North Carolina in Chapel Hill, N.C., and a justice of the North Carolina Supreme Court. The collection includes photographs of John Wallace Winborne’s student days at Horner Military Academy in Oxford, N.C.; the University of North Carolina; and Bingham School in Asheville, N.C. Also included are group or composite photographs of the North Carolina Supreme Court for several years, an autographed photograph of North Carolina Governor J. Melville Broughton, and a photographic album containing portraits of the 1906 senior class at the University of North Carolina. American novelist Thomas Clayton Wolfe (3 October 1900-15 September 1938) was born in Asheville, N.C., and attended the University of North Carolina in Chapel Hill, N.C., from fall 1916 until his graduation in spring 1920. He died in Baltimore, Md., at age thirty-seven of tuberculosis of the brain. The Thomas Wolfe Photograph Collection documents the life of Thomas Wolfe and his family. The collection comprises about 4,800 individual images distributed over six series. Among these are more than 200 photographs of Thomas Wolfe and about forty non-photographic likenesses of the author. The scope of the collection is broad both in terms of subject matter and time frame. The earliest photographs, dating from the mid-nineteenth century, document the Pennsylvania family of Thomas Wolfe’s father, William Oliver Wolfe. The most recent photographs are of Wolfe’s brother, Fred Wolfe, who lived until 1980. The earliest photographs of Thomas Wolfe in the collection date from 1901. The last photograph of Wolfe was made in July 1938, during his hospitalization near Seattle, Wash. Collection holdings are strongest from 1901 through 1920, the years in which Wolfe lived in North Carolina, but his later life is also well represented in the collection. More than thirty photographs document Wolfe’s 1938 automobile tour of the western United States. The collection also includes original prints of the novelist taken by noted New York photographers Doris Ulmann and Carl Van Vechten. Patrick S. Wooten is a 1993 graduate of the University of North Carolina at Chapel Hill in Political Science, who went on to obtain a law degree and serve as Assistant Attorney General in the North Carolina Department of Justice. The collection contains images (negatives and photographic prints) of the memorial tablets inside Memorial Hall at the University of North Carolina at Chapel Hill. These photographs were taken as part of a project completed in the summer of 1992 to create a Memorial Hall reference guide, which was published in 1992 as A Guide to the Tablets of Memorial Hall at the University of North Carolina at Chapel Hill. Bayard Wootten (Mary Bayard Morgan Wootten) was a female pioneer in the field of photography. She was successful as a photographer and studio operator from the early 1900s through the early 1950s, when the field was dominated by men. Wootten was born in New Bern, N.C., and, although she travelled across the United States during different periods of her career, North Carolina was her home. Her first studio was attached to her home in New Bern. In 1928, she opened a studio with her half-brother George C. Moulton, a partnership that spanned over 30 years. George and another of Wootten’s siblings, half-sister Celia Moulton, helped Wootten keep her studios running in New Bern and Chapel Hill while she was out in the field taking photographs. Wootten lived in Chapel Hill, N.C., 1928-1954, returning to New Bern shortly before her death in 1959. The Bayard Morgan Wootten Photographic Collection includes over 90,000 images and other materials created by Bayard Morgan Wootten and the Wootten-Moulton studios. Formats include glass negatives, film negatives, photographic prints, lantern slides, and artwork; there are also some manuscript materials. Bayard Wootten’s work, circa 1904-1954, is the focus of the collection, and there are many examples of the scenic landscape photography (much of it depicting mountains of western North Carolina) and scenes of daily life of both white and black citizens of the more rural areas of North Carolina for which she is best known. While most of the images are from North Carolina, there are also images taken in South Carolina, Virginia, and a few other southern states. Also included are images depicting members of the Wootten, Moulton, and Clarke families. The Catherine and Robert Yates Collection consists primarily of photographs of Chadbourn, North Carolina, around the turn of the twentieth century. Many images depict the strawberry industry, including strawberry fields, markets, and the first long-distance air shipment of strawberries in 1946. Other images depict Chadbourn streets and scenes, businesses, schools, and railroads, as well as other areas in North Carolina and Virginia. Also included are images of various individuals, including William Harmon Chadbourn.